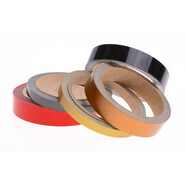 Adhesive film strip for interior and exterior | YOW! For self-adhesive film strips, there are many possibilities for use, for example, trailers can be made, or furniture, shop windows and cars beautified at will. The self-adhesive strips of high-quality foil are each one to two centimeters wide, 10 meters long and available in different colors. This durable film is suitable for both wet and dry bonding and can be used indoors and outdoors.